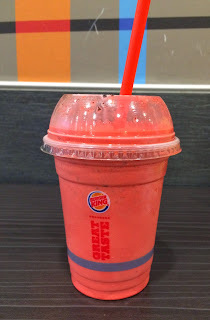 My husband saw Burger King had Red Velvet Oreo Shake recently. It's not said on the HP, but according to some courses, it's a limited time flavor. I went to try it yesterday. It's listed in the "Shakes" and I learned that the whipped cream topping is optional. This is what I got and I was upset there's no whipped cream --- details are below. 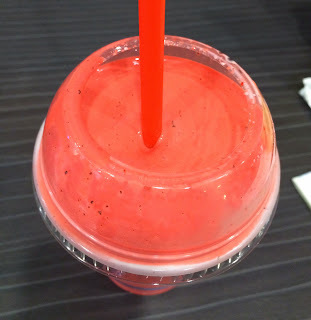 It's a bright red creamy beverage and had a sweet cake flavor. I didn't think it's got red velvet cake flavor but it's a very sweet and creamy shake. It's said it's got cream cheese and rich chocolate flavor, but I sensed neither of them. What was close to chocolate could be only Oreo cookies. 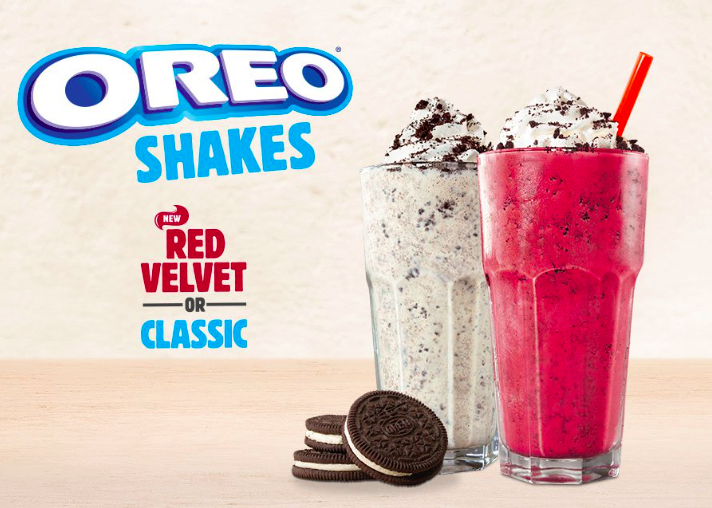 It had some bitterness of Oreo time to time, and I enjoyed this shake halfway. However, it's so sweet that I couldn't even finish the whole small cup. I ordered a small Red Velvet Oreo Shake, but they kept serving burgers and fries to those who ordered after me. It took them about 10 minutes to provide this should-never-take-long item and even they gave me a wrong flavor, Classic and asked me if I wanted whipped cream. So I said Red Velvet and the guy started making it, and in a minute, he just gave it to me this without asking me about whipped cream, which was quite disappointing as the product doesn't look good without it. 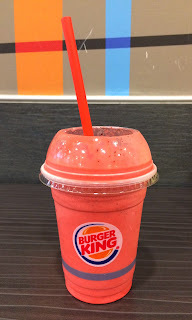 Especially in NYC, I never had a good experience at any Burger King branches.